The photo really says it all doesn’t it? But I’ll go ahead and confess: I’m terrible about cleaning my son’s room. I try to tackle it about once a month if that. Little Man has free reign of his room every morning before I get him up as well as during during “quiet playtime” in the afternoon(he doesn’t always nap). Whenever he is in there alone he likes to dump out ALL his toys. It just seems pointless for me to clean them up every day. I know that a few months ago I was the one sharing simple chores that toddlers can do; and I while I attempt to have him assist me with household chores, and give him small responsibilities of his own, in reality, sometimes it’s much easier to do it all myself! Sometimes I’d rather clean up the entire train set in 30 seconds myself than spend 3 minutes coaxing and coaching him through it. Sometimes I clean it all and he watches like a king. Other times I completely ignore the messes in his room and still struggle to keep the rest of our tiny apartment clean. I want to be able to seize the “teachable moments” more, and get him into the habit of cleaning up after himself, but that doesn’t actually always happen. It’s my goal, but not necessarily the reality of our every day life. Some days, but not all. baby steps. And today Little Man and I will be tackling his room! So there’s my ‘confession’ for the week year. There’s always something to be working on! I will keep you posted on how we do cleaning/organizing his room, and the rest of the house. Looking for more encouragement/confessions? Click the button below to find a list of all the posts in this series. What about you? 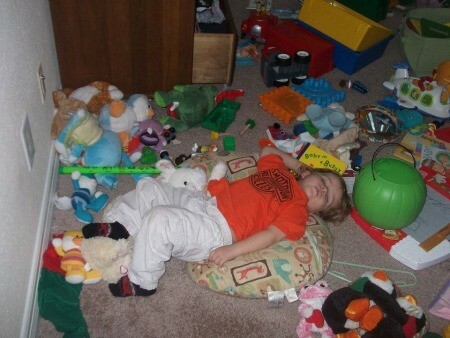 Do you clean your kids’ rooms, ignore them or let them do it? How does that go in your house? and what do think works best? So glad I found your blog today! I love it, and this post hits home for me! I have such a struggle keeping my oldest daughters room up. This really helped. Can’t wait to read more! We tend to do shorter clean up times like 15 min/day, or during commercials, or pick up everything red, or 20 things. You can do it, and if it doesn’t get done, that’s okay too! Blessings! I know what you mean! Sometimes it is easier to clean it up yourself than let them clean it up! But it does instill good traits and teaches them if we do let them :) I only clean up my son’s room once a week with him because otherwise we would be in there everyday probably 2x a day, haha. So we set aside every Saturday AM and my 3 year old and I will clean it up together and then I will vacuum :) I love that time we spend together and now it is a routine for him and he doesn’t get frustrated about it being everyday. I have had the same struggle with cleaning on their rooms. It is on their chore chart but I know I need to up the time I spend in their rooms just to help train them. They need someone to come along side them and make it more rewarding. I know it is fun for me when the kids decide to help me willingly. Its so hard sometimes just to slow down long enough to spend that time on it when you already have to clean and organize the rest of the house and prepare the meals. Thanks for this encouragement Paula. Haha, I feel like that too. It takes so long to get my 2 to clean up and all the fussing, I mine as well do it myself. Their rooms looks like that too and I try to stay out of there! Messy, messy. Stopping by to follow you via Thumping Thursday! Yep, my son’s room looked like that much of the time! It looks a whole lot cleaner now that he’s gone to college! haha. I really think the main thing you can do is to help your kids see what clean looks like. If it’s always a mess, they start feeling real comfortable with that. Scoop things into baskets (even laundry baskets work) and bins – a quick 5 minute pick up with the timer and the clean up song -so the idea that clean up is part of life starts becoming a habit. You’ll always have to do most of the work yourself, and be prepred to work on this until they graduate. And being ok with less than perfect makes your life a whole lot easier! Your photo is classic…and something you’ll always treasure. My kids don’t play in their room, which means it’s clean. The play room on the other hand…………….. I don’t have too many toys in my daughter’s room and she really doesn’t have “free play time” in there too often, though that’s probably going to change with a newborn on the way! What I have done and it’s worked rather well, is to divide her toys into 4 totes. She gets one tote of toys for a few days then we switch. This way all her toys fit on one small bookshelf and a few on the floor. It gives us a place for everything which makes clean up easier and toys with small parts stay together. We try to clean up before nap, before daddy gets home from work and before bed. Not always perfect, but she knows how to do it. Hey Buddy!, I found this information for you: "I don’t often clean my son’s room – Confessions of an Imperfect Mother #20". Here is the website link: https://www.beautythroughimperfection.com/i-dont-often-clean-my-sons-room-confessions-of-an-imperfect-mother-20/. Thank you.